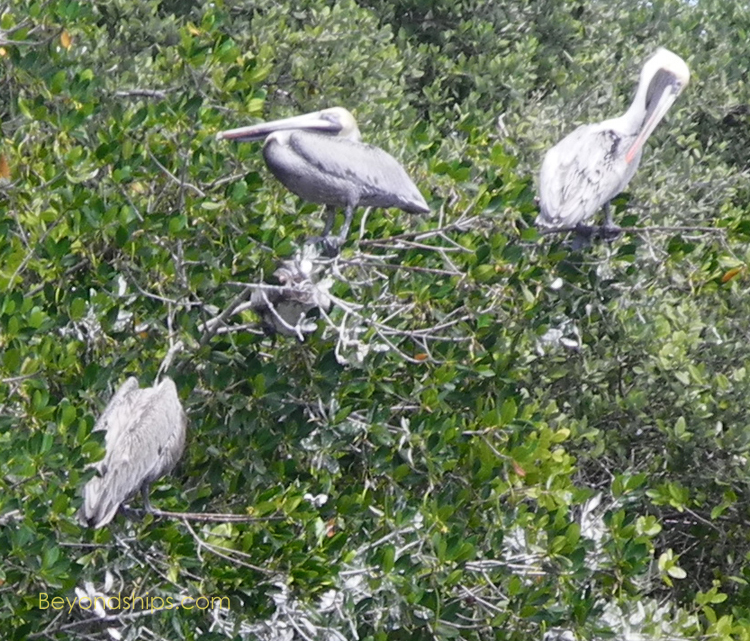 Exploring Florida's wilderness by pontoon boat and airboat in search of dolphins, manatees and alligators. Above: The pontoon boat used in my salt water expedition, searching for manatees and dolphins. Below: An encouraging sign as we entered the canal. Above and below: For most of the voyage, the sides of the canal were covered with thick vegetation. A number of exotic birds made an appearance. At long last, the object of the quest. Cruise ships calling at Florida ports frequently offer shore excursions in which passengers can explore the state’s rich natural environment. Even for those who are not particularly green, these tours can be a memorable adventure. A ride on an airboat is thrilling just by itself. Encountering wild animals unconstrained by civilization is a much different experience than seeing them in a zoo or theme park. Shore excursions into Florida’s wilderness areas are often offered as post-cruise excursions on cruises that begin and end in Florida’s cruise ports. However, they are also frequently offered on cruises that include a Florida city as a port of call on itineraries that begin and end elsewhere. 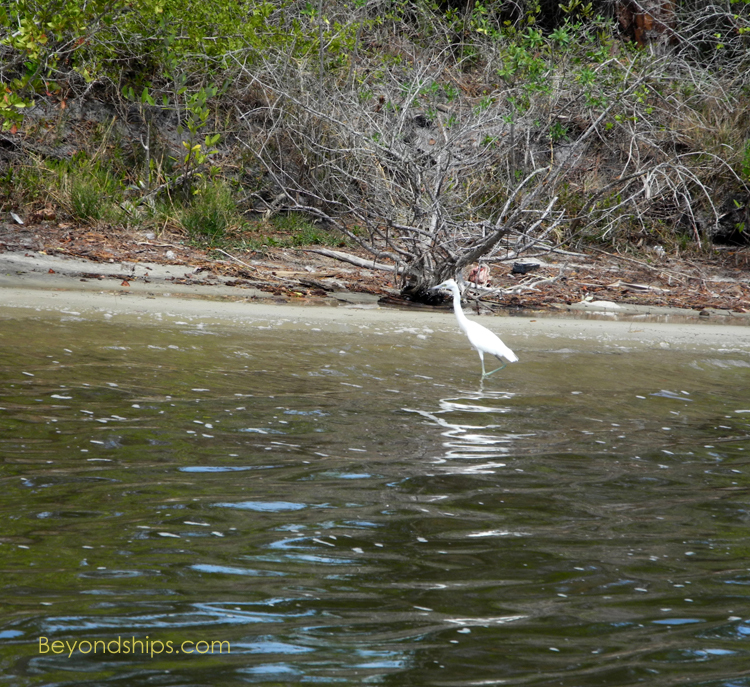 Florida’s best known wilderness area is the Everglades in the southern part of the state. 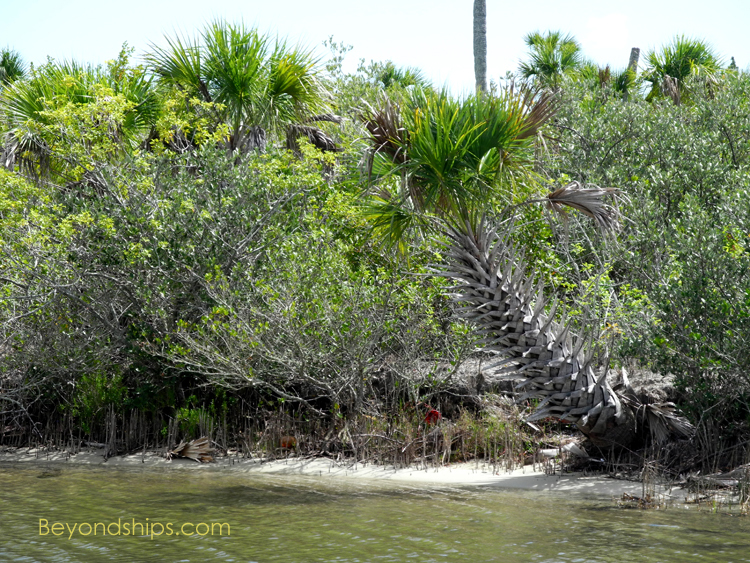 However, there are also wilderness areas in other parts of Florida. Thus, wilderness excursions are offered from other ports, not just the cruise ship capitals of Miami and Fort Lauderdale. 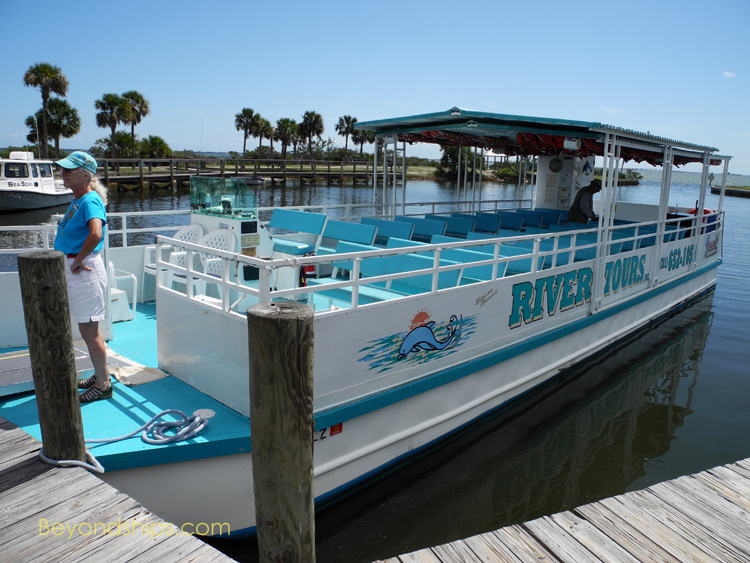 In Port Canaveral, which is on the east coast of the central part of the state, the wilderness tours offer an alternative to the day trips to the theme parks in Orlando or to a day on nearby Coco Beach. (Another alternative is to tour the John F. Kennedy Space Center, which is well worth a visit). 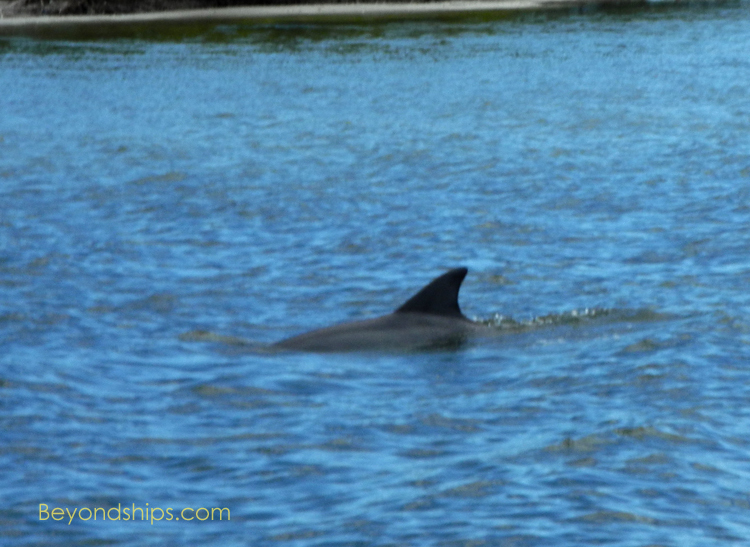 The wilderness tours tend to focus on seeing what local guides term “Florida’s Big Three” - - alligators, manatees, and dolphins. While all sorts of other creatures can be encountered, the Big Three are clearly the stars of the show. They are what people come to see and the guides tend to build up excitement by concentrating on the Big Three as they give their commentary. Since alligators prefer fresh water while dolphins and manatees prefer salt water, it is unusual to see all three on one excursion. Accordingly, you have to take a fresh water excursion and a salt water excursion in order to see all three. (Some cruise lines, e.g., Norwegian Cruise Line, offer a package that combines a fresh water tour and a salt water tour on the same day). 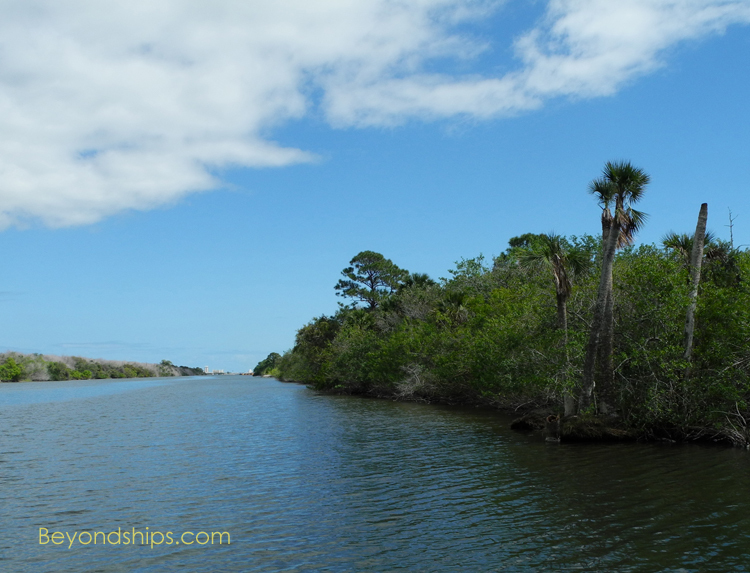 The salt water tour that I went on explored the estuaries near Port Canaveral, including the Banana River, where salt water from the sea meets fresh water from inland. After a short bus drive from the ship, our tour group alighted at Kelly Park, a small green area dominated by a public dock. There we boarded a pontoon boat for an hour cruise. The boat was a flat-bottomed, rectangular craft with about 10 rows of benches in two columns. An awning covered the aft two-thirds of the boat leaving the forward rows open to the sun. The captain drove the boat from a set of controls forward on the starboard side. This craft was not built for speed. Rather, it proceeded along at a jogger’s pace. The canals and even the open stretches of water that we traversed were calm. As a result, the only motion we encountered was when the boat crossed the wake of another boat. As we proceeded outward from Kelly Park, the captain spoke about the two creatures that were the focus of our quest. Manatees are large, gentle aquatic mammals. They live primarily below the surface, grazing on sea grass. However, they have to surface to breathe and so you can see them when they come up for air. Also, sometimes you will encounter one sleeping on the surface. Manatees are an endangered species with only about 5,000 individuals left in the wild. Of these, some 1,000 are believed to reside in the Port Canaveral area. Whereas manatees are slow and awkward, bottle-nosed dolphins are fast and streamlined. They are meat-eaters, devouring about 15 pounds of fish a day. No threat to humans, they are playful, curious and intelligent. The captain’s introduction served to increase the feeling of anticipation as we crossed first a broad stretch of the Banana River and then sailed into a narrow man-made canal. All eyes scanned the surrounding waters intently for a dorsal fin or the flip of a manatee’s tail. On either side of the boat, wetlands vegetation and low tress grew down to the water’s edge. 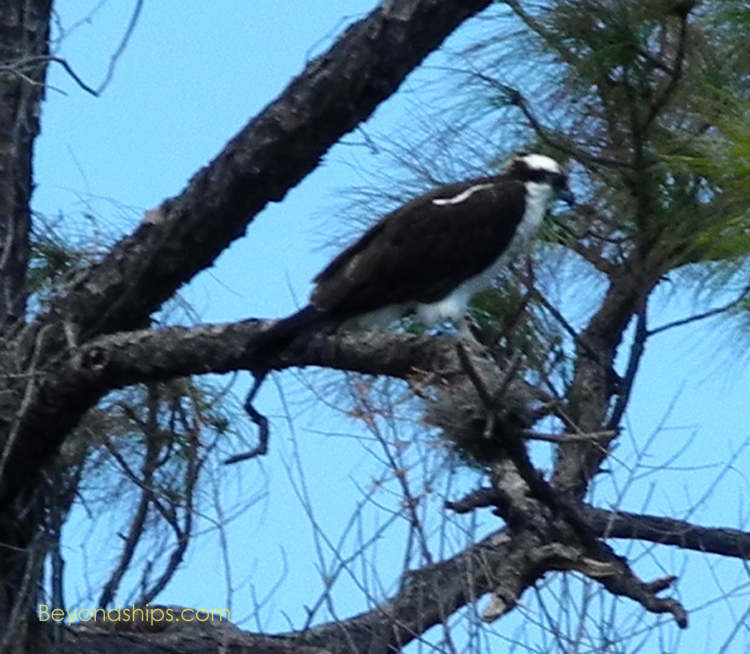 We saw osprey, pelicans, heron, hawks and numerous other species of birds. Meanwhile, the one-woman crew distributed soft drinks and snacks. It was a pleasant boat ride. However, as time passed and there were no sightings of manatees or dolphins, disappointment started to descend upon the explorers. Obviously, the tour operator had no control over the wildlife. Nonetheless, the captain said apologetically that there had been numerous sightings the day before in these waters and that he could not understand where all the manatees and dolphins had gone. Then, as we were heading home across the broad estuary, someone spotted a dorsal fin. The captain maneuvered the boat towards where the fin had been sighted. For a moment after we arrived, we waited in silence, all eyes scanning the surrounding waves. Suddenly, a large grey dolphin broke the surface causing a happy buzz of conversation to run through the boat. This, of course, was a wild dolphin, not one that had been trained to do a variety of tricks. He did not jump out of the water. Rather, as he surfaced for air, you could see him cast an eye towards the boat. It did not especially interest him and so he continued with what he was doing. He dove down again but then reappeared a minute or so later, just swimming along. While the dolphin was not impressed by us, the people in the boat were quite excited. Where would he surface next? Oh, there he is! Each time he broke the surface, a renewed wave of excitement would wash over the boat. When the boat eventually returned to Kelly Park, the passengers were still buzzing. It had been a nice ride in the sunshine. The dolphin encounter completely overshadowed the reluctance of the manatees to put in an appearance. There was no doubt which creature the people had come to see.